(Salt Lake City) - Gone are the days of heavy science textbooks with over-used examples and hard-to-grasp lessons. The Genetic Science Learning Center (GSLC) at the University of Utah is bringing science education into the 21st century with an online, interactive and multimedia curriculum that teaches up-to-date concepts in evolution and genetics to high school students. The newly released and freely available curriculum, Evolution: DNA and the Unity of Life, can be found on two complementary websites: Learn.Genetics, geared for students and the public, and Teach.Genetics, for teachers. Since the Next Generation Science Standards (NGSS) were released 5 years ago, teachers have been demanding curricula based on the guidelines. The new GSLC materials meet this need while bringing a fresh perspective to the age-old topic of evolution. Early lessons explore genes and basic biological functions that are common to all life on earth—some of the newest and most compelling evidence that all living things share a common ancestor. Later lessons also feature DNA, both as the source of differences in traits over time and as a record of evolutionary change. 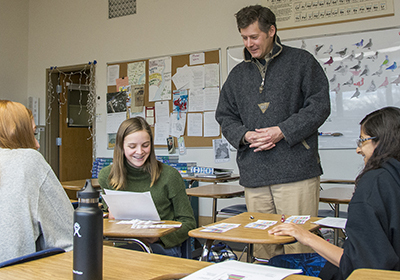 Along the way, interactive multimedia lessons and paper-based activities engage students in valuable skills including interpreting data, using models and constructing evidence-based arguments. Support materials make it easy for teachers to prepare lessons quickly. At first glance a little silver fish called the stickleback may not seem inspiring. But the finned subject of several lessons in the Natural Selection module of the GSLC’s Evolution unit is helping students and teachers think differently about science. A video introduces students to a real scientific conundrum: What happens when a population of ocean sticklebacks is introduced to a nearby lake? Will their characteristics change to become more like other lake sticklebacks? Students step into the role of scientist to find out. Through an interactive online game, they collect fish and analyze data from actual scientific studies to build their argument. These lessons typify the unit’s approach, explains Rob Wilson, who taught the curriculum to 9th graders at Rowland Hall Upper School in Salt Lake City last year. “What’s really exciting about the curriculum is that students discover the concepts for themselves and come to their own conclusions with guidance,” he says. More than a flashy package, the GSLC unit effectively teaches evolution. Scientific methodologies were used to evaluate students’ knowledge before and after instruction. More than 2,250 high school students from diverse backgrounds taught by 38 teachers in 23 states across the country participated in curriculum testing. High school students who learned evolution through the GSLC unit significantly outperformed students taught with comparable NGSS-aligned materials. With new funding from the National Science Foundation, the GLSC plans to develop an evolution curriculum for 6th to 8th graders. The middle school curriculum will be available in 2022. The GSLC is already known for developing the most highly used online biology education resource in the world. More than 16 million unique users from nearly every country visit their Learn.Genetics and Teach.Genetics websites annually. “Evolution: DNA and the Unity of Life” was created with support from the National Science Foundation. Assessment measures were developed and administered by a project partner, Project 2061, an initiative of the American Association for the Advancement of Science.